Are missing teeth causing you to feel self-conscious about your smile every day? Do they make it difficult to enjoy your favorite foods? 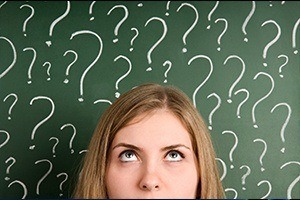 Do you have a denture you’re always afraid is going to fall out of your mouth? If so, then you’re facing the same problems as the over 100 million Americans with missing teeth. 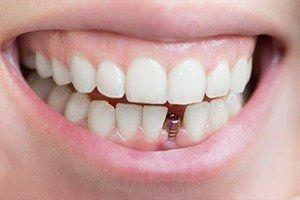 Fortunately, modern dentistry has come up with a solution to this growing problem: dental implants. At Aegis Dental, Dr. Chandy teams up with local oral surgeons and periodontists to provide patients with the most complete and natural-looking tooth replacement available today. Whether you are missing a single tooth or an entire mouthful, we can use dental implants to help rebuild your smile. A dental implant is actually a small titanium post that is placed directly into the jaw to mimic the root structure of a lost tooth. 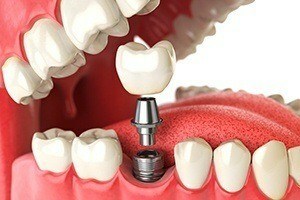 Once there, it can be attached to a variety of dental prosthetics to replace any number of missing teeth. 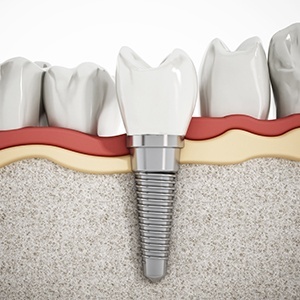 What is it like to get dental implants? 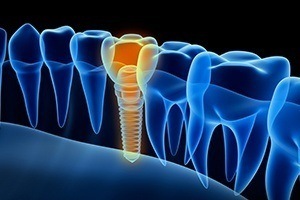 The dental implant procedure involves two main phases of care: placement and restoration. Before placement can occur, you’ll need to undergo an oral exam performed by Dr. Chandy where she’ll determine if you’re a good candidate for dental implants (more on this below) and what kind of restoration you’ll need. After the exam, you’ll be referred to a local trusted oral surgeon or periodontist to actually place the posts within your jaw. This procedure can be completed in just one appointment, and most patients only need local anesthesia to feel comfortable throughout. Afterward, you’ll be given a few months to heal, during which the implant(s) will actually “combine” with the surrounding bone through a process call osseointegration. When you are fully healed (which can take 3-6 months), you’ll return to Aegis Dental to receive your new teeth. 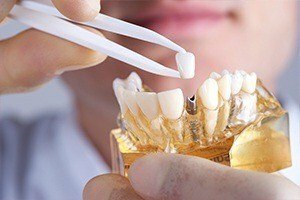 Dental implants can be used to support crowns to replace single teeth, bridges to replace multiple teeth, and even dentures to replace an entire row of teeth. The restorations themselves will attach directly to the posts, and they’ll be designed by Dr. Chandy to perfectly blend in with your smile. Once restoration is complete, your new teeth will be virtually indistinguishable from real ones. They’ll be just as strong and durable, plus you can maintain them simply by brushing and flossing like normal. Qualified candidates for dental implants need an adequate amount of healthy jawbone to support the posts, decent oral and overall health, and they cannot have any uncontrolled systemic diseases (such as diabetes). Should you have any of these issues, Dr. Chandy can work with you to have them corrected before proceeding with the implant procedure. To learn more about dental implants and what they can do for your smile, contact us today to schedule a consultation.